It’s National Nurses’ Week. The American Nurses Association’s theme for the week is Inspire, Innovate, and Influence. We have considered the ways your RN’s do just that in your special clinical setting! Working with pregnant women, those who support them, and those who serve alongside one another to share in the initial pregnancy discussions and decisions, create an important clinical setting for patient care. Nurses are a critical part of the mission at your Pregnancy Medical Clinic. Without them, your medical services wouldn’t be possible. The nurses at your PMC INSPIRE by giving their best care to their patientsand their families, which is crucial to your organization’s mission to save lives. Not only do they offer medical knowledge to your clients, they also offer a listening ear as a woman shares her emotions about her unexpected pregnancy, a hand to hold after a positive pregnancy test turns a woman’s hopes and dreams upside down, and a decision tool empowering her to make the best possible choice for herself and her baby. These nurses are the heartbeat of your medical practice! Nurses INNOVATE by creating the best possible outcomes for their patients. Your nurse’s steady hand guides the ultrasound probe to share the most crucial medical information her patient needs in order to make an informed decision about her pregnancy. She might even share a decision-making guide with her patient, encouraging her to follow her heart as she decides what is best for her and her baby. She shares relevant medical facts, hoping that a positive outcome will be possible for both the mother and the baby. Nurses INFLUENCE your medical clinic by offering up new initiatives and reformsto better serve your community. Her knowledge of medical practices and procedures safeguard your clinic to be above reproach in all that you do. She influences the community by sharing the work that you do at the clinic with those in other clinical settings. She might be a stickler for rules and charting, but she’s working hard to set the standard in the medical community. Your nurses are a vital piece to the work you’re doing and the lives you are saving. Have you taken the time to celebrate your nurses this week? If not, there are still a couple of days left! We’ve gathered some resources for you here, if you’re looking for some suggestions. 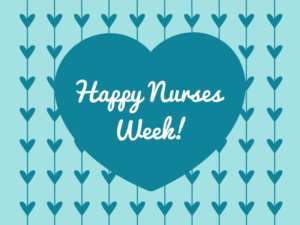 There are some super simple, but very cute, ideas out there to let your nurses know that you love and appreciate all the hard work they do!